I’ve written before about my experiences living with people with mental health problems. While I’m not sure I ever considered their lives more important than mine, I definitely did on some level feel that it was righteous of me to make myself miserable in the hope that it would – if not actually make them happier – at least not make their problems worse. My experiences, however, have usually been focused on one person at a time. 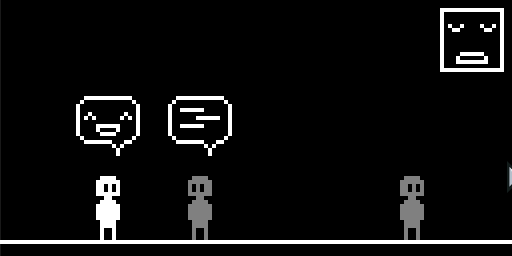 In Florian’s Meditation, the little pixellated person undergoes conversation after conversation with a series of other – greyer – pixellated people, listening to them offload their troubles, offering a smile, and then moving on. On each screen, the initially beaming face in the corner falls, and eventually appears to even become bloody. Since the protagonist’s speech bubbles remain smiling throughout, we can assume this face in the corner represents their internal state. It’s a simple and effective representation, so I really only have one small gripe, and that’s that I’m not sure it’s right to have the protagonist only turn grey at the end – after talking to themselves? – when that could have been a gradual change throughout. It seems more realistic, to me at least, to be gradually worn down by other people’s problems, but perhaps others would find their patience actually runs out all at once.